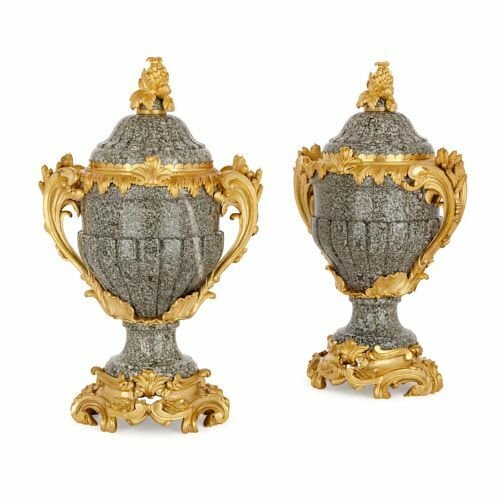 These grand, Louis XV style vases are crafted from grey-green marble, and beautifully contrasting lustrous, golden ormolu (gilt bronze). 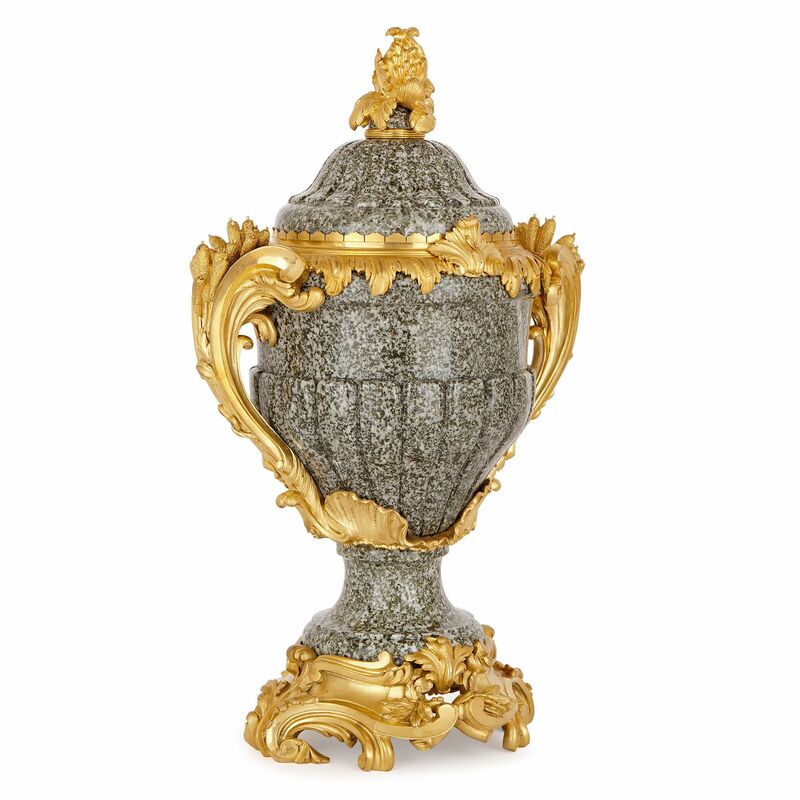 The vases are set on ormolu bases, composed of Rocaille style acanthus leaf mounts, laurel leaf branches and scrollwork, and set on C-scroll leaf feet. The grey-green flecked marble vases stand on waisted stems, and feature ovoid-bodies, which are partly gadrooned. 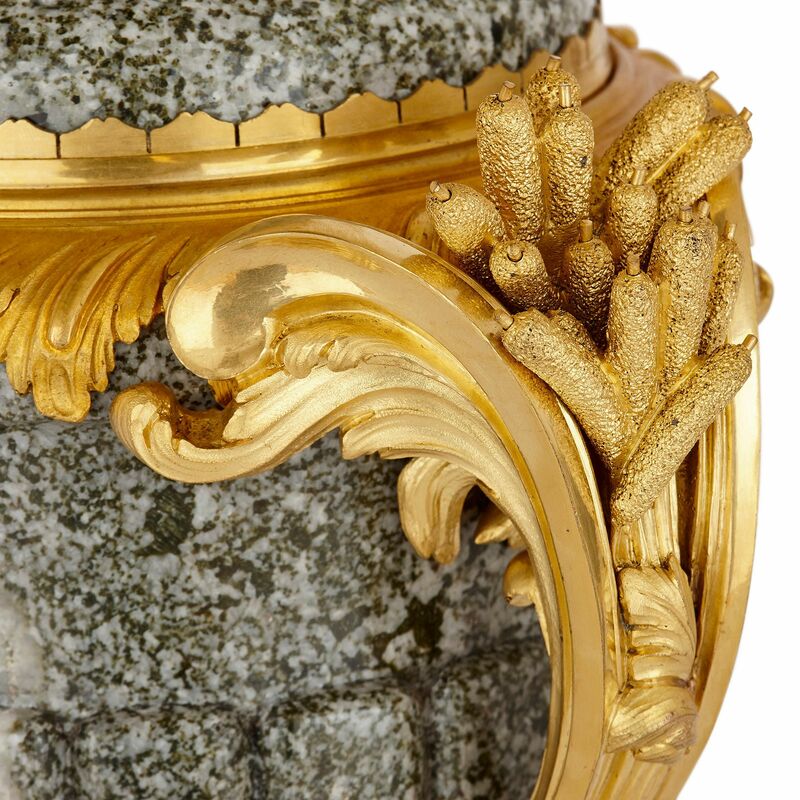 Each vase is mounted with two ormolu handles, which take the form of scrolled acanthus leaves, enclosing bulrushes. 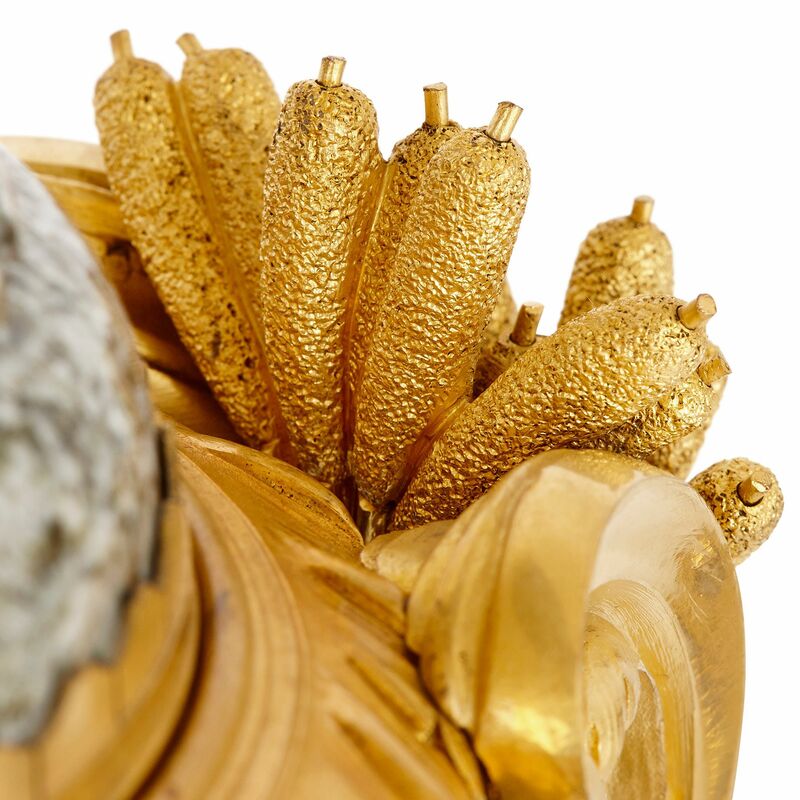 These handles are attached to the lower bodies and mouths of the vase bodies, which are edged with ormolu acanthus leaves. 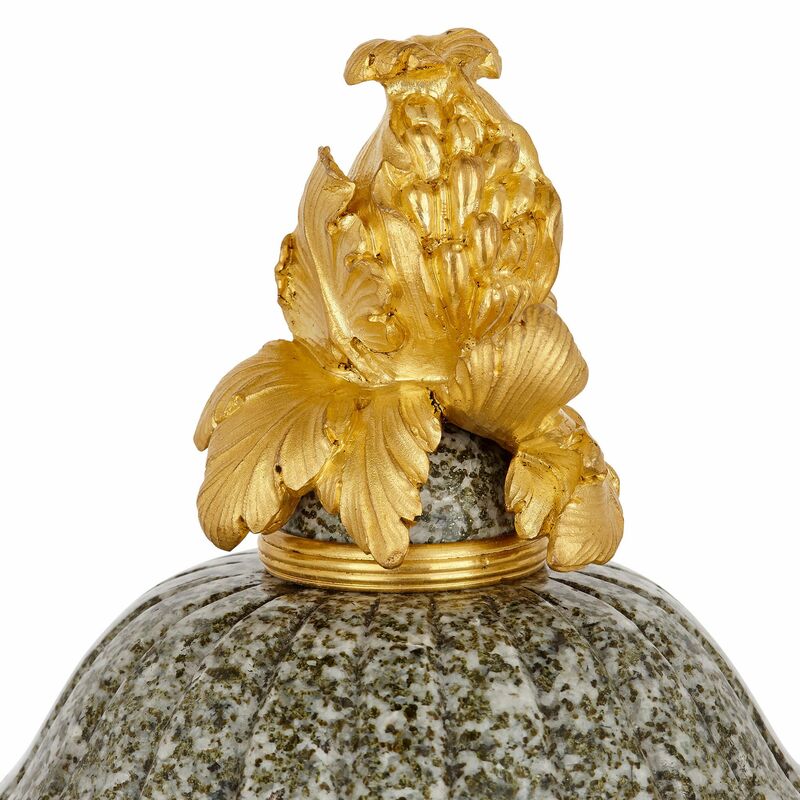 Each vase is topped by a domed and gadrooned marble lid, which is surmounted by an ormolu pomegranate finial. These vases are based on a model which was made for the private apartments of Louis XV at Versailles, and which is now on display in the Louvre. 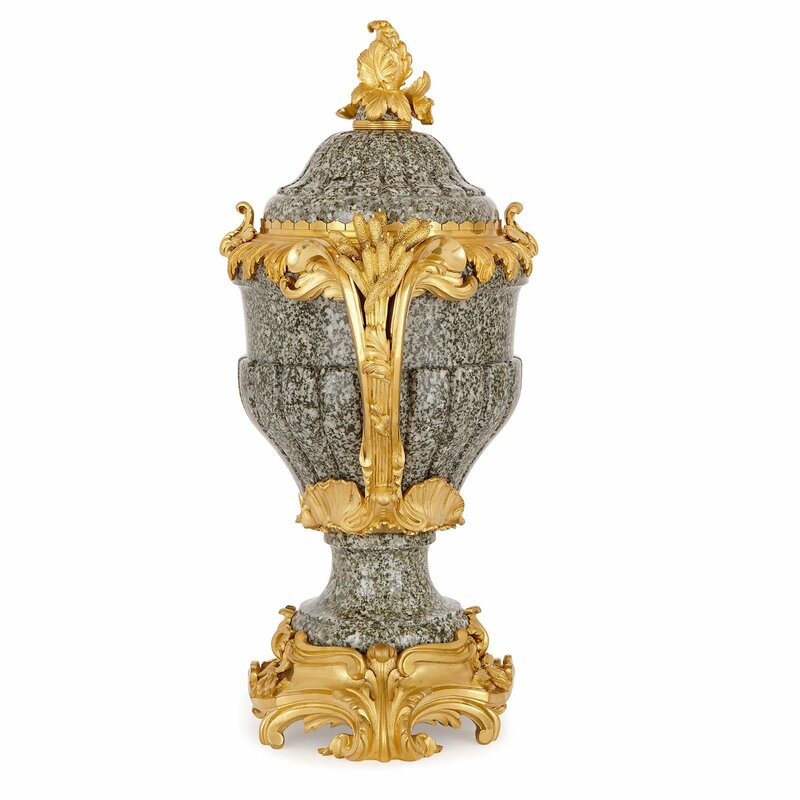 This vase form was recreated by the leading craftsmen of the 19th Century, including Louis-Auguste-Alfred Beurdeley, Henry Dasson, and François Linke. 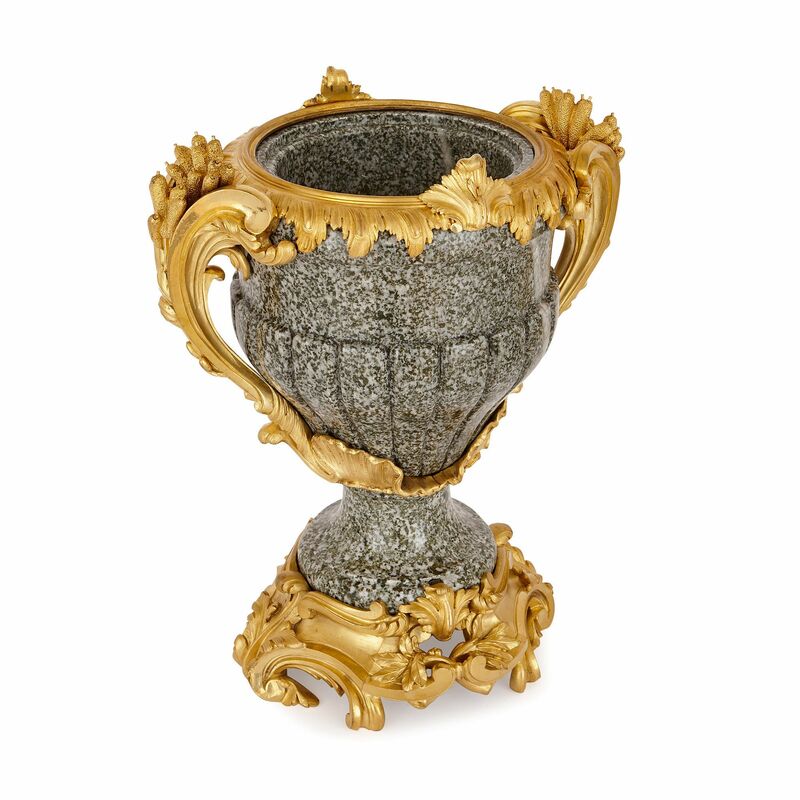 Indeed, Linke created two vases, similar to this pair, in purple fleur de pêcher marble (see Christopher Payne, François Linke, 1855-1946: The Belle Epoque of French Furniture, Woodbridge, 2003, p. 205, pl. 223). For other examples of this model, see Christie’s Paris Sale 5473, ‘Important Mobilier et Objets d'Art, Orfèvrerie, Céramiques Européennes, Verre et Art d'Asie’, 21st June 2007, Lot 161 and Christie’s NY Sale 1818, ‘19th Century Furniture, Sculpture, Works of Art and Ceramics’, 11th April 2007.